The "F1" is a high definition, two-way monitor system special designed to meet the high demands of broadcast studios, OB vans and professional recording studios. The "F1" gives a transparent sound and a wide stereo image. The system consists of a high degree tuned cabinet with a built in amplifier/crossover unit. The "F1" can be delivered in two types of cabinets. A square angle version for free standing operation and a special 19-inch rack version. 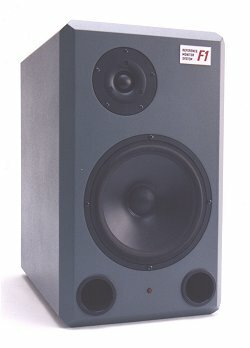 The "F1" comprises an 8-inch woofer with a mineral filled polycone and a 25-mm dome tweeter housed in a vented cabinet. An audiophile version of the 4th order Linkwitz-Riley filter, with a crossover frequency of 1850 Hz is built together with two power amplifiers in the speaker cabinet. The balanced inputstage has an adjustable sensitivity from -10 dB to +12 dB. With an equaliser corrections can be made in steps of 2 dB at 50 Hz. The "F1" has a high pass filter with 3 selectable frequencies. View the "F1" specification sheet.